Today, July 25, 2013, the United States Mint released the collector 2013-P America the Beautiful Five Ounce Silver Uncirculated Coin honoring Great Basin National Park in Nevada. It is the third uncirculated coin this year from the America the Beautiful program with earlier 2013 coins commemorating White Mountain National Forest in New Hampshire and Perry’s Victory & International Peace Memorial in Ohio. At $154.95, none other in the series have launched at a lower price. The earlier issued 2013 coins are on sale for the same amount but they debuted at $179.95. 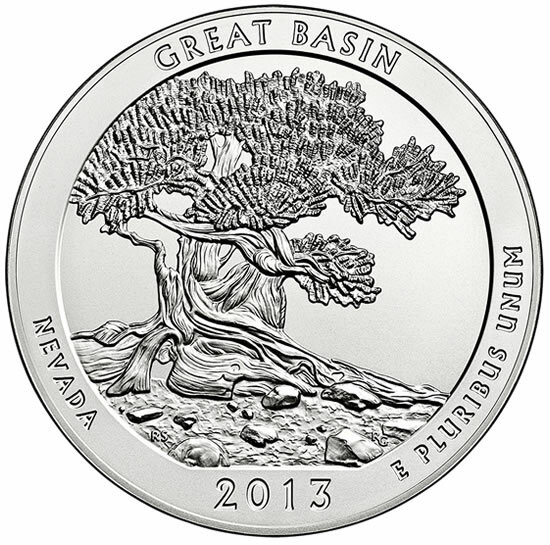 Actually, the Great Basin silver coin was initially scheduled for release on June 27 for $179.95. Due to tumbling silver, the U.S. Mint postponed its release until today and it also cut prices on silver coins. 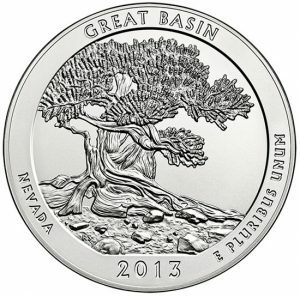 Though on a much larger scale, designs on the uncirculated coin are exactly the same as the companion Great Basin National Park Quarter which was sent into circulation beginning on June 10, 2013. On the heads (obverse) side is the 1932 portrait of George Washington by John Flanagan. The portrait has been restored to bring out the subtle details and beauty of the original model. Inscriptions on this side of the coin read, "UNITED STATES OF AMERICA," "QUARTER DOLLAR," "LIBERTY" and "IN GOD WE TRUST." The mint mark of "P" is also shown to notate the mint of origin, the U.S. Mint in Philadelphia. The tails (reverse) side of the of the Great Basin National Park Five Ounce Silver Uncirculated Coin features a design that depicts the beauty and unique qualities of a single Bristlecone Pine tree and shows the rocky glacial moraines where the trees grow. Inscriptions on this side include, "GREAT BASIN," "NEVADA," "E PLURIBUS UNUM" and the year, "2013." Incused on the edge of all America the Beautiful silver coins are ".999 FINE SILVER 5.0 OUNCE," marking their weight and fineness. Each of these collectibles is struck in 99.9% fine silver weighing in at 5.0 troy ounces. The diameters are 3.0 inches and their thickness is 0.165 inches. These silver coins are produced with an uncirculated finish and have a maximum mintage of 25,000. 2013-P Great Basin National Park Five Ounce Silver Uncirculated Coins may be ordered from the U.S. Mint either from its website, right here, or by phone at 1-800-USA-MINT (872-6468). There are no ordering limits. Every coin is encapsulated, set inside a protective outer box and accompanied with a United States Mint Certificate of Authenticity. In addition to the Great Basin uncirculated coin for collectors, the U.S. Mint sells a bullion version intended for investors. It was released on June 24 and has current sales of 17,400. Bullion coins from the Mint are not sold directly to the public. A limited number of authorized distributors buy them from the Mint. They must order at least 100 coins of one design, with 100 coin ordering increments. Distributors pay $9.75 over spot for each one. The coins eventually make their way into the consumer market for a few dollars per ounce over the spot price of silver. The program of America the Beautiful 5 Ounce Silver Uncirculated Coin began in 2010 and will continue until wrapped up in 2021. Each new release, at a rate of five per year, features a different national park or other national site. 2013 marks the fourth year of the program. Here is a table of 2010- and 2012-dated ATB Silver Uncirculated Coins and their final reported sales amounts before they were declared sold out or they went off sale. The five releases made available last year did not sell up to their mintage limits as the U.S. Mint produced fewer based on early collector demand. Cheaper prices this year have renewed interest in the series. 2013 coins that have not been released yet will honor Fort McHenry National Monument and Historic Shrine in Maryland and Mount Rushmore National Memorial in South Dakota. They are scheduled to launch in August and November. The lower price is nice. The spread between the P coins and the bullion varieties is narrowing though, so the lower price won’t last.